There’s so much meaning in this famous Robert Frost poem. I can’t help but think of it whenever I think about the future or make plans for the direction in which to take my business. 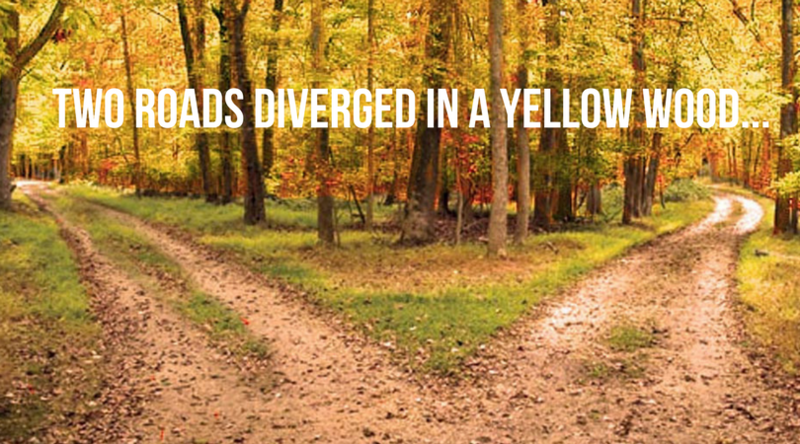 Being a financial advisor doesn’t mean you’re stuck in a single path. You have choices – but only if you can imagine them and see a clear path to achieve them. Most advisors are on what I call the GROWTH path, but I’d also like you to consider a different path – the GURU path. Whatever path you’re on – I’ve outlined some strategies below to give you a clearer vision for how you might proceed on that path. Depending on what your vision for your business looks like, you might end up on the growth path – where you’ll make a plan to get in front of more prospects, take on more clients, and increase assets or fees (or both) to increase revenue… the growth path. Who wouldn’t want to 10x their income? More clients = more assets (or fees) = more $. The growth path is where you don’t necessarily want your current service model to change – you just want to earn more doing the same thing you’re doing now. The key is to educate and provide tremendous value, so your prospects know, like and trust you and when it comes time make an offer, they’re much more likely to say yes than if you had just tried to get an appointment and convince them to hire you. After they’ve paid you for a service, they’re much more likely to hire you to manage their plan assets or other aspects of their plan. Maybe you think of folks you see speaking at our industry conferences like Fred Reish, Marcia Wagner, Brian Graff. These folks are definitely experts, but the guru path is different. You earn “guru” status as a result of creating your own products and programs around your area of expertise. Doing a quick google search I also found The Eventual Millionaire (book), The College Investor, Financial Mentor dot com, Military Money Manual dot com, Online Trading Academy, etc. The list goes on… but are you starting to see a pattern? The key is to pick a topic and an audience, brand yourself, create something of value that people are willing to pay you for… and launch! I’m confident whichever path you take, if you commit to it, and follow a few simple, proven strategies – you’ll get there. One of the easiest ways I’ve found to advance in ANYTHING is to leverage the expertise of those who have walked before you – those who have experience and have achieved the kind of success you’d like to have. Dan Sullivan is a genius at teaching folks how to brand themselves and take their intellectual capital and turn it into a money-making machine through his program called The Strategic Coach. Jeff Walker is a genius at teaching folks how to market their brand and products and services through his program called Product Launch Formula (PLF). As much as the formula is used to launch new products, in the financial world I see it work extremely well to introduce you to new prospects online so they know, like, and trust you… to build authority and credibility and a relationship, making the appointment or sale, or engagement easy. In other words, Jeff’s formula for presenting yourself online to prospects, can help you convert a higher percentage of prospects to clients in a shorter amount of time if you’re on the GROWTH path, and can most definitely help you create and launch your own products and programs if you’re on the GURU path. Whichever path you choose – growth or guru – I hope the strategies above will help you envision how to proceed. Onward and upward. Disclaimer: As a PLF affiliate partner I may receive a commission from Jeff if you invest in his program, but at no extra cost to you.